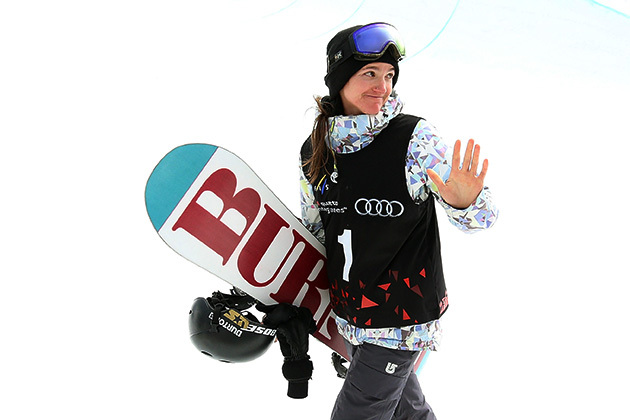 Heading into the Burton U.S. Open, an event she has won eight times, snowboarding star Kelly Clark looks back at her long and distinguished career and discusses what it’s like to be a role model and mentor for a new generation of athletes. Kelly Clark will go down as one of the most important figures in the history of snowboarding, regardless of gender or discipline. A dominant force across all of the biggest events since her debut in 2000, Clark has reached the mountaintop so many times that the trail might as well be named after her. Ryan Wallerson: You’ve won the U.S. Open eight times, one more top finish than at X Games (seven gold medals). Is this your favorite event? Kelly Clark: I would say the U.S. Open is my favorite event of the year, but I don’t necessarily think it’s just because of how well I’ve done over the years. I think it’s the history that I personally have with it. I grew up nine miles from the Open when it was in Stratton, Vt. I was a spectator before I was a competitor. Then I was a pre-qualifier that didn’t make it into the event for years before I made it in. I saw my heroes at the U.S. Open as a kid, so for that reason it holds a special place in my heart. And then having had success so many times definitely makes this my favorite event to do well at. Is that relationship you have with the Open the reason you’ve always done so well here? Do you get more pumped for this event than others? KC: I’m always excited about the Open, but I think that has to do with where it is in the season. You look at X Games; it’s in late January. You’re just getting into your full stride for the season. December is like the warm up, when you focus on getting all of your tricks back. In January, you’re normal and maybe you’ll even progress a little bit. But when you get to the Open, it’s March. Your riding is where you want it to be. It’s at a really high level. I think that contributes to my success at the event more than anything. RW: If someone told you at the beginning of the season that you could only have one victory of the two, would you want it at X Games or the U.S. Open? KC: I would rather do well at the U.S. Open; that’s an easy decision. RW: What is your relationship with snowboarding like today, and how does it differ from the beginning or your career? KC: I’ve developed into the person I am because of snowboarding and through snowboarding. I think sports do that. They teach you life lessons and help you mature as a person. I started competing because it was fun. I had a moment when I was 14 years old and I learned that the Olympics had snowboarding. I recorded it on a VHS tape and watched it countless times. I knew then that this is what I wanted to do with my life. So I chased it down. Four years later, standing on the podium at the Olympics, I was overwhelmed. I never had aspirations of being famous or having success. I just loved snowboarding. That hasn’t changed. But when I was younger, I looked to get something out of snowboarding. I looked for it to make me happy, to be fulfilled by it. But I realized that wasn’t the way to go about it. I began snowboarding for myself, not for anyone else. I’ve maintained that enjoyment. People look to my results and accomplishments and measure me by that, but the fact that I participated in my 17th X Games this year, that I still love what I do, that is probably my greatest achievement. How has it been going from the rider with the proverbial target on her back to the senior figure surrounded by a new generation? KC: In the last few years, my role in the sport has really changed. We don’t see Torah [Bright] at as many events. Gretchen [Bleiler] retired. A lot of my peers are no longer around. I didn’t really have a lot of influence with my peers. The competitive tension got in the way of that. It’s hard to receive advice from people that you are threatened by. When the younger kids came up, there was the big age gap and I was already so well established, all of a sudden I had all of this influence. It wasn’t like I was this competitive threat to them. It’s been really great with Arielle [Gold] and Chloe and all the girls. If there are things that I’ve learned that will help them be more successful, I want that for them, I want that for the sport. 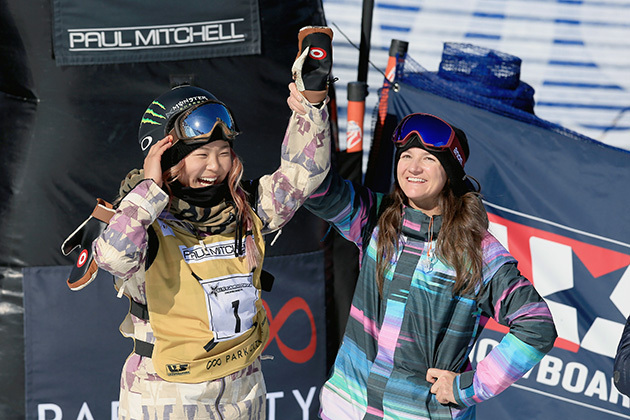 RW: You and Chloe Kim have had some battles over that last year, and she’s come away victorious in many on them. What’s your relationship been like since she took off?
. It’s been great to see her progress and take snowboarding so far. I’ve been proud of her for a long time and I will continue to be proud of her in the years to come. We have a great friendship. She knows I’m accessible. At this point in her career, I think the best thing I can do for her is to just be there for her. Things come up in your career as you grow up. It’s a journey. I just have to make myself available. RW: Besides Chloe, who else among the younger riders do you feel you have that kid of relationship with? KC: Arielle and I have a really great friendship. We talk all the time. This year it has been especially great because while in the past I’ve usually been the one encouraging her, I’ve found that she’s been the one encouraging me this season. I’ve been thankful for that. I’ve had my ups and downs this season; sometimes you just need someone to tell you that you can do it. That’s what makes snowboarding so cool. It’s not about one person. It’s about the sport. I hope I set that example. Whenever I end up retiring, I hope those relationships continue. RW: Who was your mentor when you were in Chloe and Arielle’s position? KC: There was rider on the Burton team when I started, Anne Molin-Kongsgaard. She did things on a snowboard that no woman had ever done. She was the first woman to land a frontside 900 in competition. She went bigger than everyone. She was who I looked up to the most; someone who helped push me to this point. Anne was a big mentor from my X Games debut through that first Olympics. RW: What is your favorite moment of your career? KC: You value things based on what they cost you. Olympic medals are prestigious. You recognize their value. I look at my Olympic medals; those are the ones that stand out. My bronze medal from Sochi in 2014 stands out the most. I would say it’s easy to be a rookie like I was in Salt Lake City. You don’t have many expectations. You hit the gas and go. I wouldn’t trade my experience in 2002 for anything, but when I look at that Sochi medal, I know what that one took. I know how many days it took, how much disappointment and hard work went into it. The night of the contest, I fell on all five runs in practice. I fell on my first run in competition. The only run I landed all night was enough to put me on the podium—12 years after I first got there. It wasn’t by best snowboarding, but it was one of the most meaningful runs of my career. After such a long and storied career, what is your motivation to continue on today? KC: I’ve had an abnormally long snowboarding career. That’s no secret. I’ve recognized that in snowboarding, you can never be the best. You have to constantly invest in it, and I do. It takes more today to be excellent at what I do and pursue my dreams than it ever has. I’ve done a lot of investment on the fitness side, and that’s certainly helped me to be consistent and avoid injury. I think, more so than anything, what allowed me this longevity is that I’m not looking to be defined by the sport. I’ve found that burnout doesn’t come from too much activity; it comes from unmet expectations. I have an identity outside of being a pro snowboarder. That sets me up for success in my riding in that if it were all about results, that’d be a pretty rough ride. I learned that through the Olympics. They should not be a destination, but just a great addition to a great career. I think that’s allowed me to push myself year after year, the security to be comfortable taking risks and aspiring to progress. RW: How much longer do you want to compete professionally? KC: I get asked that a lot. People ask me from the perspective of, “You’ve done so much for the sport, you’ve won a lot of medals.” I think the reality is that if medal count was supposed to be my cue to go, I should have stopped a while ago. That hasn’t been what motivates me for a long time. I still don’t believe I’ve hit my full potential yet. I have something left to contribute to the sport in terms or tricks and progression, but also in terms of the girls I’m with, where I can continue to set them up to be successful. I also think I’ve got one more Olympics in me. I would love to make my fifth Olympic team. That would be a huge accomplishment. If I do, I don’t plan on just making it either. I plan on going for it. RW: What haven’t you been able to do that you’re looking forward to in retirement? KC: Having a dog. I’ve always wanted one, but never been able to have one. That’s probably the biggest thing. I love the lifestyle I have right now, but we all know I can’t do it forever. When it ends, life with my dog will begin. I’m looking forward to that.